Yeah, I can really see that, thanks. I admit I changed to front facing light some time ago to cut the workload . I'll give it a serious second thinking, it is not like I am going super fast anyway. 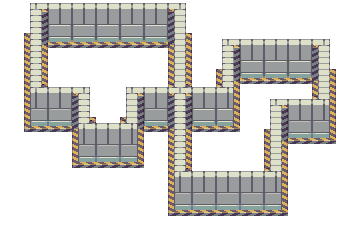 And diagonal walls, needs some fixing, but the tiling works in principle. Currently it is still too generic and clean. 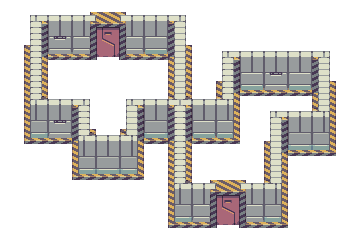 Simple rectangular wall tiles, I am working on different values and tile variations. Well, they do now contrast is a hell of a thing . The walls are also better, I believe you can see it makes the room more readable. Edit: ops, you reversed the angles on the upper half of the shadows. Edit2: suggestion, maybe outline the green tiles with the save darker color on the border of the monk tiles so they look like parts of the same solid pillar. Sharply highlight only the bottom green tiles. It might integrate them with the lower vertical part. Yep, I am with eishiya and curly, it is much better. Those tiles directly below the green ones, which look like they have some kind of statue carved in them, I would try to make them as dark as the darkest portions of the stairs. I would keep about that level of value for all walls. Also agree with eishiya in the shadows on the stairs, they should zig-zag between being 45° on the horizontal-bright portion of the steps and 90° (vertical) on the darker portions that are vertical. Before texturing anything you should try to have very distinct shades to represent vertical planes (darker walls), horizontal planes (floors) and inclined planes (ramps/stairs). If light comes generaly from above, walls should be darker, floors should be lighter (because they are facing the light more directly), and ramps should be somewhat in between. Of course, when detailing a scene not everything will be made of the same material, and some materials are inherently darker regardless of shading (dark stone vs bright stone in your case) but first get the basic values straight, then variate latter. So what I am suggesting is that, at first, you try to draw the scene with mostly flat color tiles, maybe just some outlining, to get a feel of the 3d shape of the scene. 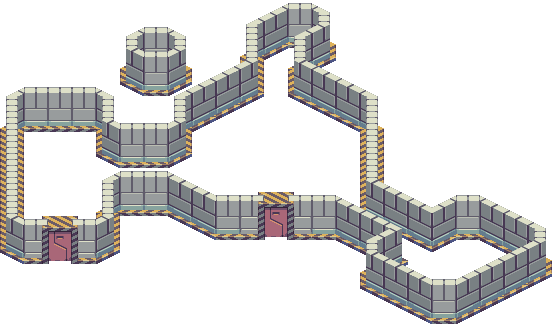 If you have trouble defining a scene with very flat shaded tiles, then the texturing will only make it harder. Chances are that you will spot some geometry mistakes that you were not noticing before because of the distractions. After that you can start to cast the shadows on the floor, and then texture over the values that already give an idea of the basic 3d solids the scene is made of. 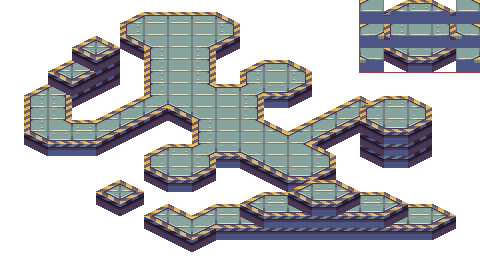 As a rule of thumb, the texturing should be less detailed than the characters, so they stand out over the tiles. First it would be best if you get a grip on the perspective and view you want to achieve, the whole ship seems to have some angle ambiguity on the lower part. Try to make a simple sketch on how the ship looks from the side, back, up and down. It doesn't even have to be pixel art, just a doodle on paper so you get an objective notion of it's shape, not confused by the angled view. Turning it on the y axis like you want would involve more than flatly turning 45° the already angled up sprite, like pixelbit it is showing here.